You can have the best camera, lens, model and location but if you don’t have the “know-how” or foundation of production skills your images will not be the best they could have been. The hallmark of a true professional cameraman is the ability to deliver great images anytime and anywhere. A professional will also be able to do this repeatedly. There is saying that I like – you are as good as your last shoot, so being able to repeatedly produce great images is a must for a professional. While I agree gear doesn’t matter, it really does. Having the gear to make what you do the easiest is a no brainer. While some shoots allow plenty of setup time, others you have to jump right in and start shooting. So, having versatile gear is a must. Gear that’s been built for Professional use is made with this in mind. Just as in any trade or profession Good gear just gets out of the way and makes it easier to get the results you want. Lesser tools may take more work. Also, good gear is durable, built to be used all day, every day. Using lower-end gear can prove to be difficult to work with, for example high quality cine lenses have their lowest F-stop at around 2.8 where cheap lenses can be around an F-stop of 5.6. This removes the opportunity to shoot shallow depth of field images. Many cameras put basic functions in menus which means it takes longer to find the setting you need to change and slow you down while also taking you mind away from creating images. At the end of the day making great images is about the cameraman, not the camera or the lens or any other piece of gear. A client must remember they trust the person holding the camera, not the camera itself. A good cameraman can make great images with almost any camera. So in terms or pro gear the camera doesn’t matter. And it really doesn’t unless you have specific needs, and then it does. For example, a client may have a post workflow they know and trust as so need a particular file format, or they need 4K or 8K images then output matters and the kind of camera you have determines this output. Great visual communication causes some sort of emotional response. It should be able to tell a story through its composition, lighting, and its subject matter. Great images have the ability to communicate with the viewer. They may transporting you to another place and time and make the viewer care and become engaged by capturing the energy of the subject. A great cameraman can do this by first seeing the qualities needing to be portrayed, then with the use of light, shapes, colours and composition evoke an emotion and drawn the viewer in. That’s what makes great images and videos. At the very core, a camera is just a tool for capturing light. The impact of images will still depend on the subject matter, the composition, and the light. 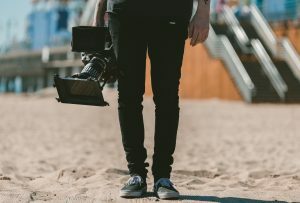 Having a camera that’s designed to be used for professional video work means things you need to adjust are readily available and not hidden in a menu. As cameraman, our brains are constantly making shifts from one side to the other as we have to be both the technical and creative. The less attention we have to give to making a camera do what it should do, the more attention we can give to being creative and capturing the moment. This is where muscle memory comes in. Muscle memory is an incredibly important for practitioners of this craft. I know I can capture better shots if I can put my eye to the camera and never take it away and still be able operate the camera. 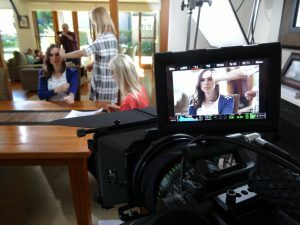 To not have to consciously think how to operate the camera leaves us to focus on the things that are ultimately truly responsible for great videos – being present, seeing in new ways, making creative decisions about interpreting your scene and finding the best expression of the thing that has captured your imagination. These are the biggest reason I use the cameras and gear I do.